For style and comfort this is your go-to piece. 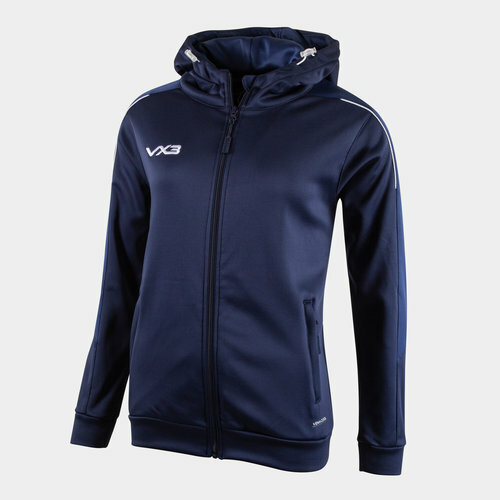 Ready to pull on to stay warm in at the match, or at training or out and about this VX-3 Pro Ladies Full-Zip Hooded Sweat in Navy, Yale Blue and White is perfect. Designed with the VX-3 logo proudly embroidered on the right side of the chest and back of the neck this sweat comes in a smart navy and yale blue design with white trimming. The full zip and drawstrings on the hood allow you to wear this hoodie how you like and create your own fit. With two pockets for storing valuables, this jacket comes with ribbed cuffs and hem. Proudly pull on this VX-3 Pro ladies Full Zip Hoodie anywhere. Combine this sweat with the VX-3 Pro Gilet or Quilted Jacket for the ultimate matching look that'll have you protected from the elements and in total comfort.